Please read my review at Modern Myth Media! I’m really enjoying your reviews, John. Any thoughts on who this mysterious Lennox is? I heard you say you weren’t enjoying “Justice League” on the MMM Podcast. I’m definitely in agreement. I just can’t wrap my head around how so many people seem to be loving it when it’s just so atrociously bad. It’s kind of like everything I don’t like about comics thrown into one book. I guess there’s no accounting for taste. I’m gonna try to hold out and hopefully it’ll improve (I heard Lee is off the title in March so at least the art won’t make my eyes bleed). Are you considering dropping it or are you gonna try to stick it out too? Thanks as always for the comment, Alexander! I appreciate the kind words, sir. I swore that issue 4 of Justice League would be my last … but the Batman stuff in issue 5 was cool enough for me to give it one more chance. I zone out any time there’s anything going on with Cyborg, and I don’t like how most of the characters are written (except for Wonder Woman), but Batman did something interesting in issue 5 that’s got me curious. But I still think the book is nowhere on the level it should be. So I’ll see how I feel in a month. What did you think of issue 5? Issue 5 was still really “Meh” for me. I’m curious about some of the stuff Bruce did, but more in a “WTF?” kind of way than being genuinely intrigued by what’s going to happen next. This story feels like an outline of a story rather than an actual story. There’s simply not enough space in 22 pages to provide the kind of depth needed to tell the story of the Justice League forming and Darkseid (who looks awfully busy and flamboyant for someone who just “Is”) invading Earth. The whole unmasking part, which seemed to be the emotional centre of this issue just fell completely flat for me. Bruce taking off his mask and revealing his identity has just been done so many times that it carries zero impact for me anymore, and Hal Jordan not even knowing who Bruce Wayne (the richest guy in the whole world) is was a little bizarre. What the purpose of him running around sans cape and cowl is remains to be seen, but I’m having trouble imagining a reason that’s any less contrived than the rest of what’s been in this series so far. 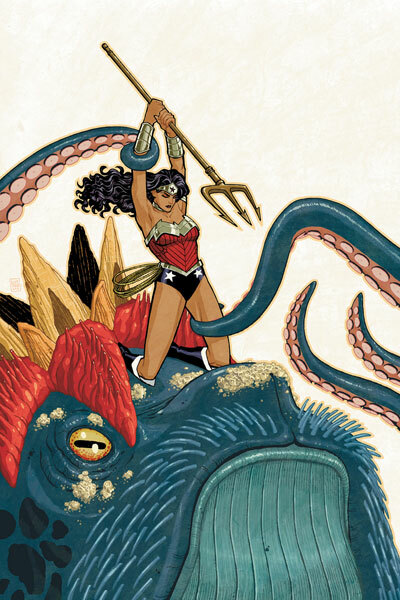 I will agree that Wonder Woman is written pretty well, but she’s been basically a non-character for most of this story. I thought the religious people protesting because she’s pagan was really clever though. That little piece of background has sadly been the highlight of this book for me.